The law firm of L. Craig Kendrick, Attorney at Law, is dedicated to providing quality personal service and sound legal advice to clients facing bankruptcy, divorce and other legal issues. We represent people in Florence, Kentucky, and the surrounding areas and help them through the entire bankruptcy process to obtain a fresh start on their finances and life. Our commitment to personal service and compassion in times of need has been one of the leading hallmarks of our firm. We offer one-on-one consultations with our leading attorney, L. Craig Kendrick, who has more than 20 years of legal experience. We take the time to understand your issues, values and goals. We work with you to find creative solutions that fit your particular legal needs. At our law firm, we believe in providing clients with relevant information so that they can make informed decisions regarding their financial futures. For those facing bankruptcy, we will help you determine whether you're eligible for Chapter 7 or Chapter 13 bankruptcy by explaining the key issues involved in both. We can help you stop wage garnishment, creditor harassment, repossession and foreclosure. Together, we will find creative solutions to your finances to give you a fresh start. 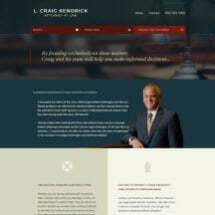 At the law firm of L. Craig Kendrick, Attorney at Law, our focus is accessibility. We are committed to promptly returning your phone calls, and offer free initial consultations to answer all your legal questions and address your concerns. In all areas of our practice, we work closely with you to develop practical and creative solutions designed to meet your unique legal needs.